Search Engine Marketing supports more Search Engines! Support for over 100 new search engines has been added to the Reporter and when applicable, to the Generator, Submitter, Page Critic and Traffic Analyzer. This brings Search Engine Marketing's total to more than 200+ engines. Whether you were looking for more global search engines, or wishing to optimize for audiences in other countries, Search Engine Marketing will help expand your reach. More visibility means more traffic to your Web site. If you don't have a top 10 search engine optimization, Search Engine Marketing will get you some! 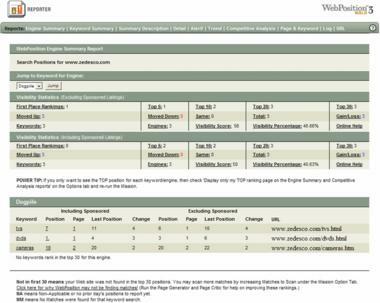 Search Engine Marketing has integrated WebTrends and WordTracker Keyword functionality into the standard tool set. 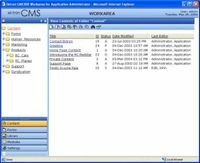 The Graphical User Interface is completely redesigned for easy use and added functionality. 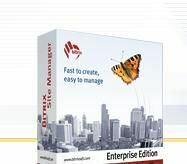 The Search Engine Marketing Platinum Upgrade provides the Platinum tools Meta Manager, Link Defender and Code Defender. The Platinum upgrade also provides 25 additional Search Engines including Google Adwords, Google Groups and Shopping Search Engines such as Froogle. Search Engine Marketing Platinum 3 is a "Must Have" tool for every webmaster and website owner. Search Engine Marketing 4.0.785 includes modifications to maintain compatibility with Google.